In what could be the musical event of the year, thrash's big four - Metallica, Megadeth, Slayer and Anthrax - last week played their first ever shows together. The foursome are out on the road as part of the Sonisphere festival, and Anthrax's Scott Ian thinks the thrash masters could head out together again once Sonisphere is done and dusted. The Anthrax mainman told Blabbermouth that Metallica hold the key to any future big four dates, but he thinks that the tour could head out to the US. Presumably making each band an absolute mint if attendance figures of 80,000+ for the initial European shows are anything to go by. 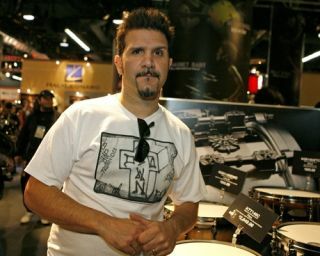 It seems that everyone has something to say about the big four, with Anthrax sticksman Charlie Benante telling NME TV that the pre-show meal the bands shared was like a "high school reunion". Lets hope nobody sat Dave Mustaine next to Kirk Hammett, or Lars Ulrich for that matter. Talking of which, Metallica bassist Rob Trujillo also chatted with NME TV, saying that it was important for Lars and James Hetfield to "reconnect with Dave Mustaine". Quite what that reconnecting involved we're not too sure, but after the awkward reconciliation between Dave and Lars captured on the Some Kind Of Monster DVD, we'd sure love to have been a fly on the wall when it happened. For more on the big four, look out for the August issue of Rhythm, which is out 6 July and features an awesome thrash cover feature.